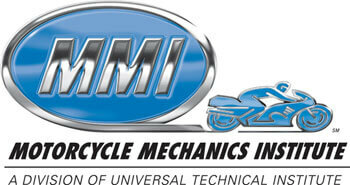 Street bikes, sport bikes, dirt bikes – Motorcycle Mechanics Institute (MMI) has them all. You will learn motorcycle theory, engine troubleshooting and diagnosis, drivability, and performance testing on some of the leading brands in the industry. MMI’s 48- to 102- week training curriculum is designed to meet the needs of a changing industry. We work closely with the manufacturers to ensure your training applies directly to the work in the field, making MMI a preferred choice for Motorcycle Technician Specialist training. Once you have the core training in place, you’ll build on it by completing one or more elective programs created through MMI’s manufacturer alliances. You will also have the opportunity to learn on ATVs, personal watercraft, snowmobiles and generators. Polish your professionalism with soft skills training and you can leave an MMI campus as a highly trained entry-level technician.